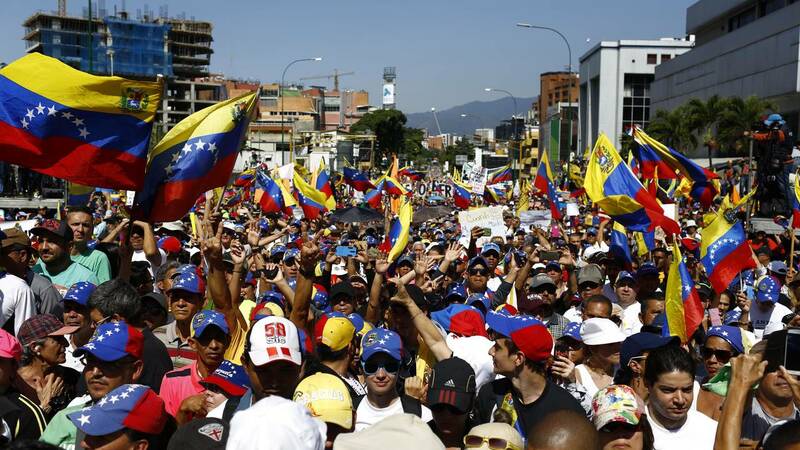 People protest during a rally against the government of Nicolas Maduro in Caracas, Venezuela. The Pentagon is developing new military options for Venezuela aimed at deterring Russian, Cuban and Chinese influence inside the regime of President Nicolas Maduro, but stopping short of any kinetic military actions, according to a defense official familiar with the effort. The official emphasized strongly that the initial work is being done by the Pentagon's Joint Staff, which conducts planning for future military operations along with the Southern Command, which oversees any US military involvement in the southern hemisphere. And even though Secretary of State Mike Pompeo recently said that "all options" remain on the table for dealing with Venezuela, several Pentagon officials continue to say there is no appetite at the Department of Defense for using US military force against the Venezuelan regime to try to force it from power. While President Donald Trump has called for Maduro to leave and has said the Russians have to get out of Venezuela, there is no indication he wants to commit US troops to a major military action there. Instead, deterrence options could include US naval exercises in the immediate region to emphasize humanitarian assistance and more military interaction with neighboring countries. The idea would be to challenge any Russian, Cuban or Chinese notion that they could have unchallenged access to the region. The preliminary planning work being done will at some point be forwarded to Shanahan, who in turn will then present ideas to the White House, the official said. The US called for Maduro to step down in February, when National Assembly President Juan Guaido declared himself interim president on the grounds that a 2018 election had been rigged. Since then, tensions have climbed as senior US officials have repeated their calls for the military to abandon Maduro, while Maduro has blamed the US for Venezuela's troubles. During a speech commemorating the 17th anniversary of the failed coup against the late Venezuelan President Hugo Chavez on Saturday, Maduro called on all Venezuelans who want to get in involved and defend their homeland to enlist and train with the military to reach the "new goal of 3 million members." Maduro reminded the crowd that last year he set the goal of 2 million military members and said "we have accomplished our mission," calling for the additional one million members to join and "defend our territory and borders." Pompeo, speaking in Paraguay on April 13, reiterated that all options remain on the table for Venezuela. "We keep all options on the table because it's very important, in that we don't know how things will proceed," he said. The top US diplomat, on a three-day tour of Chile, Paraguay and Peru, did not directly answer questions about whether the US has a strategy to deal with Maduro should he retain the military power necessary to stay in office, but insisted that any decision will be up to the Venezuelan people. "The strategy is not just an American strategy. It's the Venezuelan people's strategy," he said during an interview Saturday with Voice of America Spanish. "Sometimes people think Maduro is winning, and yet he's handed over all of his power to the Cubans, to the Russians. This is weakness from Maduro. And so this weakness will ultimately lead to his departure, and democracy and prosperity will be restored in Venezuela. I am very confident of that," he added. During his trip, Pompeo said that as Venezuela's neighbors struggle to cope with the refugees fleeing the country, "a hundred percent" of that challenge is the "direct result" of Maduro as well as Russia and Cuba, which support him. And he also rapped Beijing, another Maduro supporter. "When China does business in places like Latin America, it often injects corrosive capital into the economic bloodstream, giving life to corruption and eroding good governance," Pompeo said during an April 12 speech in Chile. "China's bankrolling of the Maduro regime helped precipitate and prolong the crisis in that country. China invested over $60 billion -- $60 billion -- with no strings attached. Well, it's no surprise that Maduro used the money to use for tasks like paying off cronies, crushing pro-democracy activists, and funding ineffective social programs. And you all know, better than anyone in America could know, the crushing, devastating results of that," Pompeo said. "I think there's a lesson, a lesson to be learned for all of us: China and others are being hypocritical calling for non-intervention in Venezuela's affairs. Their own financial interventions have helped destroy that country," Pompeo added. "It should be pointed out that for some time, some US politicians have been carrying the same version, the same script of slandering China all over the world, and fanning the flames and sowing discord everywhere. The words and deeds are despicable. But lies are lies, even if you say it a thousand times, they are still lies. Mr. Pompeo, you can stop," he added. CNN's Jackie Castillo, Stella Ko and Bex Wright contributed to this report.